France Motorhome Hire are proud to offer one of the most flexible solutions for touring the battlefields, cemeteries, historic sites and places of personal interest in both France and Belgium. You simply plan your perfect trip, taking in exactly what you want to see, pick up a motorhome from our depot just south of Paris and drive the short distance to The Somme to begin your personal tour. Driving from Sens due north through northern Burgundy one enters the Seine et Marne department which via Provins and Montmirail leads us to The Marne River at Chateau-Thierry, a mere seventy kilometres from Paris. Above the town, the vineyards of Champagne begin their eastern sprawl toward the towns of Epernay and Reims. Chateau-Thierry also talks to us of the first world war, The Battle of the Marne in September 1914 saw the breakdown of the German offensive and in 1918, in the 2nd Battle of The Marne, it was in the region of the town that the final drive on Paris was halted by the allies including elements of the American Expeditionary Force. 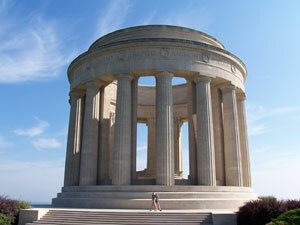 The enormous monument on the hill to the west of Chateau-Thierry offers excellent views of the valley and a few kilometres away the battlefield and cemetery of Belleau wood offer an interesting and moving insight. Driving north toward Soissons and heading east along the “Chemin des Dames”, above the river Aisne, this area marks the line of defence taken up by German forces after the retreat from the Marne and the beginning of trench warfare stalemate. French, British and German cemeteries frequent the landscape. As we travel north again toward Amiens on the Somme the monuments, cemeteries and museums become increasingly those of the British and commonwealth armies. 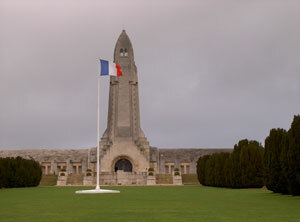 At Villers-Bretonneux the Australian national war memorial lies to the north of the village while the museum on rue Victoria is situated above the village school. 320,000 Australians saw service and 280,000 become casualties including 60,000 dead, the highest relative rate of any combatant. 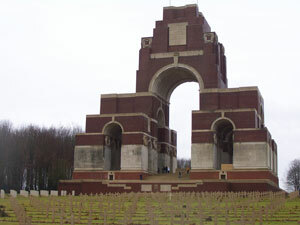 Several kilometres from Albert is the very well-preserved battlefield of the Newfoundland memorial park at Auchonvillers and close by the impressive British Memorial at Thiepval commemorates over 73,000 men who have no known graves. 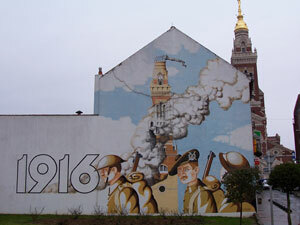 Heading south-east around the village of Longueval are situated the South African Memorial and Museum at Delville Wood. 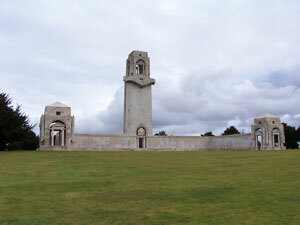 To the West of the village is The New Zealand Division Memorial and Memorial to The Missing at Caterpillar Valley Cemetery. A must see for Canadian visitors is The Vimy Ridge memorial park north of Arras where 100,000 Canadians participated in the spectacular taking of this strongly held German position in April 1917. Throughout north eastern France and Belgium there are hundreds of First World War sights, a recommended guide is the enormously useful book “Before Endeavours Fade” by Rose E B Coombs. For visitors looking to gain a more comprehensive understanding of the history and importantly the geography of WW1 and who are prepared to journey further afield, then Ypres in Belgium and Verdun in eastern France are essential to your itinerary. The 1st, 2nd and 3rd battles of Ypres in 1914, 1915 and 1917 represent, with the Somme battle of 1916, the most heavily fought over sectors of the British front with Australians, Canadians and New Zealanders respectively all playing a major role. The surrounding countryside is full of monuments and cemeteries as well as preserved bunkers and trenches that one would expect on such hard fought for territory. In the town of Ypres (also spelt Ypres, Iper or Ypern on maps) is situated the Menin Gate British Memorial to the Missing while the impressive Cloth Hall houses the excellent Salient War Museum. Verdun, for the French, is the most significant battle of the war in terms of the impact that it had and indeed still has in the minds of the population. It was the longest battle of the war, lasting ten months and resulting in over 700,000 French and German casualties. The town itself and shell pocked countryside surrounding Verdun with its damaged forts, monuments and an impressive museum are well worth seeing. 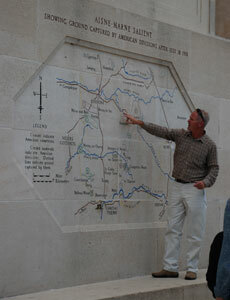 To the north and north-west of Verdun is the battlefield of the Meuse-Argonne offensive, the final and most costly of the American Expeditionary Forces’ engagements. Monuments at Varennes as well as it’s splendid museum and Montfaucon are worth a visit as well as the largest American military cemetery in France (of either war) at Romagne-sous-Montfaucon. If you are planning to visit the First World War sites of both the Somme and Ypres, we suggest you allow a minimum of two weeks for your trip. If you want to stay on formal campsites, both web sites provide details of all the campsites in each area but if you don’t want to do too much planning ahead, don’t forget our motorhomes and campervans come with guides to campsites and free overnight halts in France as well as Free membership to “France Passion” (a great scheme offering free places to stay in your motorhome at rural locations) so there are heaps of places to stay. Get in touch now to book the best solution for your personal World War One journey.